Small photo found by accident in our SPAM dump file because the enquirer had not complied with our request relating to emails: If you are writing to us, it is important that all emails have SVVS-MAIL in the 'subject' line otherwise the email is auto-deleted with the literally thousands of SPAM emails we receive. Not possible to open every email just in case! 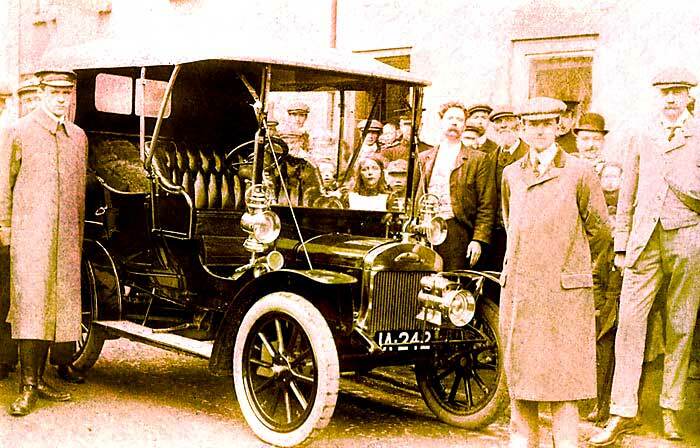 As to the car on the photo, - our Tim Harding believes it to be a cca 1897 Cannstatt Daimler, believed to be the world's first taxi. Great photo received from Peter Metcalfe (UK) showing a relative driving a car whose details they had obtained from the licensing authorities. He was not sure they had the right name and asked clarification. We can confirm that the car is a 1903 James & Browne 9HP Tonneau. It had a 'claret body'. Registration DM 9 was issued on 16th December 1903 by Flint County Council to a Mr John Lloyd Price. A similar 9hp car, also in 'claret colour', goes on the annual Brighton run. Photo received from Tony Hart Dyke (UK) showing his Grandfather (2nd left) and his brother and sisters. It was taken in Penrith in 1911. They had apparently won the car in a raffle! Nobody in the family seems to know much about the car. We can advise that it is a cca 1905 Rexette Forecar. These tricars were made between 1903 and 1906 by the Rex Motor Manufacturing Co in Coventry, later ones with V twins. 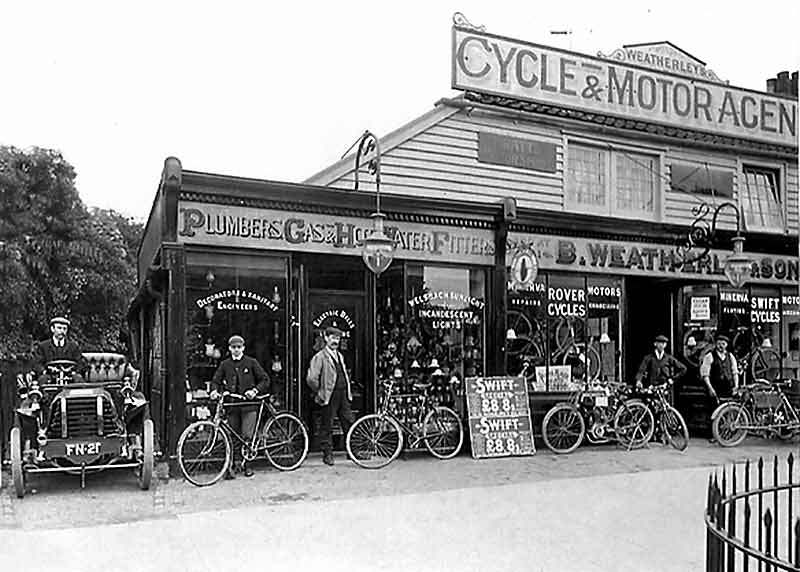 Started in 1901 with motorbikes, then cars and reverted to bikes, ending in 1914. Another Photo received from James Rankin, Co Antrim (N.Ireland) of a car owned by the Hon. Arthur O`Neill of Shanes Castle, Randalstown County Antrim. Could we identify? Our Tim Harding positively identifies it as a cca 1906 Chambers, probably a 10/12. Chambers was the most important car to have been manufactured in Northern Ireland. 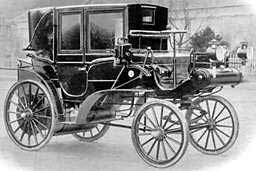 Originally named Downshire, it was designed by Jack Chambers in Belfast, who earlier designed the first Vauxhall in London. 500 made. Gorgeous Photo received from Carolyn Heathcote (nee Weatherley) (UK) showing her Grandfather's garage in Greenwich (?) around 1910 (?). Can we help with identification of the vehicle (reg FN 21). All help gratefully received. FN 21 is Canterbury Borough Council registration of around 1906/7. Our experts could not give a positive identification. Suggestions put forward were Panhard, De Dietrich, Gladiator, MMC, Little Star, even possibly a Canterbury, but none seemed quite right. Photo received from Jan Bradley (UK) which is a scan of small photo on a stereocard purchased by her husband while buying cards for his streo-view picture viewer. The definition is a bit iffy but we are pretty sure this is a cca 1911 Belsize Landaulette. Probably not a Taxi as the driver is not wearing a chauffeurs hat, or uniform. Belsize cars were superficially similar to Humbers. Landaulette bodies are identified by the fold down section to the back of the roof, frequently seen on Taxis. Photo received from Alan Reilly from Bracknell (UK). 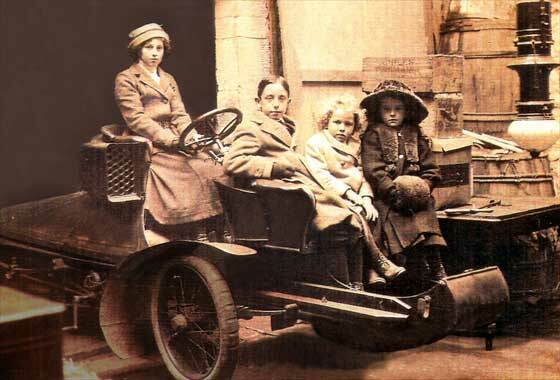 The lady in the driving seat was a Great Aunt, Annie Taylor, who lived from 1852 -1925 in Derby. From the lady’s age, guessed at around 60, it would make the photo about 1910. He was interested in the make and suggested date of the car. Slight hesitancy due to the indistinct badge but both of our primary experts feel this is a French Darracq. Side on dumb irons seem to confirm that this is probably indeed a cca 1911 Darracq. Pity no reg. 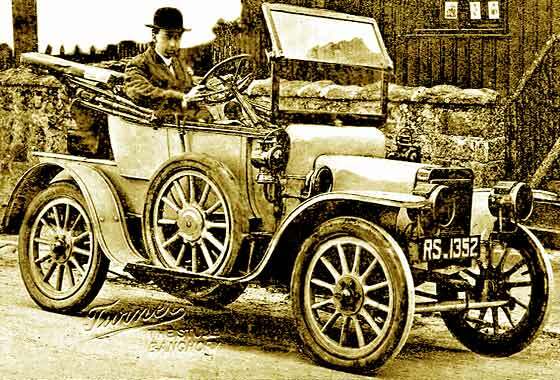 Email received from Peter Williams with an Isle of Man email address advising that he is attaching a photo of his great uncle Ferdinand Gompers in his car. He believed that Ferdinand Gompers was a notorious gambler. No date on the photo but thought probably 1900. No subsequent responses to our emails. The registration number RS 1352 was issued by Aberdeen Borough Council but no records are available to assist in dating of the registration date. 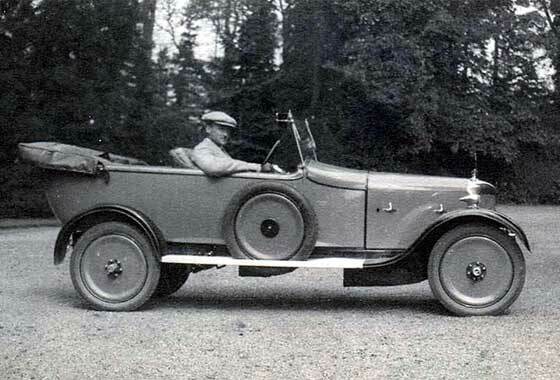 The car is a cca 1911 Rover 8. Photo received from a friend of our Alan Benewith (UK) requesting identification. This has baffled all our experts so was also sent to our friends at Prewar Car who got no further either. While perusing Georgano I came across a car which had striking resemblance to the photo. I then contacted the make museum who's expert confirmed 'I am quite sure. It is a Stoewer model C2 built in 1912 or 1913. Regards Manfried Bauer, Stoewer Museum'. The web community really can work! It can be disheartening to receive a request for help in denitrifying a car and subsequently to receive no further answers to emails sent. It costs us time and money to provide free information ! We know nothing about this photo . We can however advise that the car is a cca 1912 Humber 11 HP. An enquiry about a very similar car was received in 2006 which was accompanied by a number of photos from various angles and can be seen mid way down on http://www.svvs.org/help5.shtml . 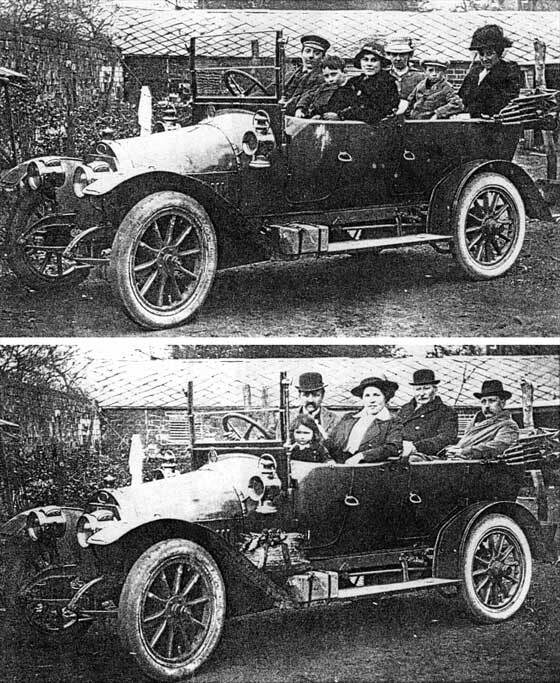 Three lovely period studies of the same car received from Andrew Gordon (UK) who is writing a biography of a naval officer who owned the car in the photos in 1914. Seems a very friendly bunch of people. Registration BK908 was a Portsmouth County Borough Council issue of about December 1912. The car is French. It is a 1912 Peugeot possibly a model a 138 or 139. Peugeots were a very good quality cars and the Peugeot car company was at the time into successful grand prix racing. Photo received from Tony Averil Thornton (UK) the editor of a nostalgic Yorkshire magazine 'Down Your Way' in which readers write about the past. 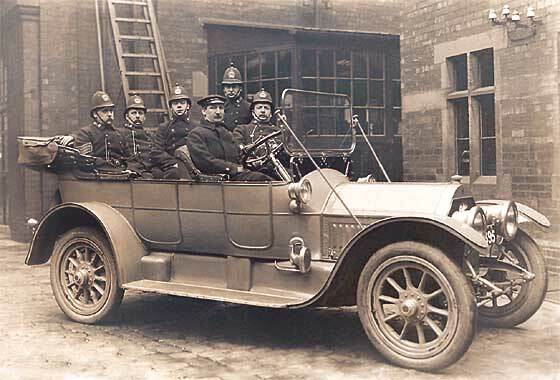 They recently featured a story about the Leeds Fire Station which prompted another reader to send in a photo of his Grandfather (left at the back) who served with the Leeds Police/Fire Service. We presume he was a policeman ! 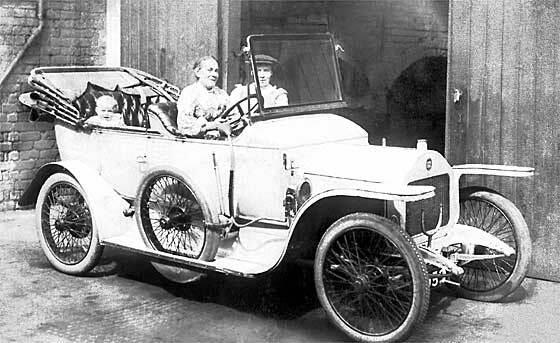 The car must have been relatively unusual for Leeds because it was a cca 1913 Cadillac Touring. A 'de-luxe' Squad Car ! Photo received from James Rankin, Randalstown, Co Antrim (N.Ireland) taken c1916 in the Shanes Park Convalescent Camp near Randalstown. 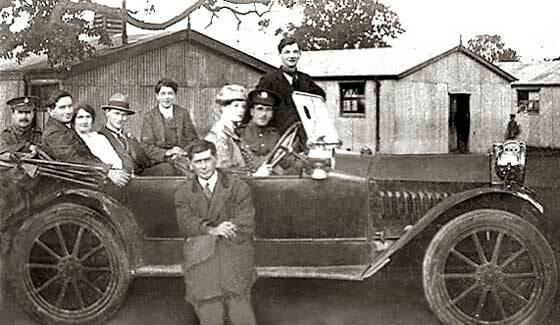 He believes the people in the car, possibly a Hupmobile, were entertainers, probably from Belfast, who performed concerts for the soldiers in the camp. 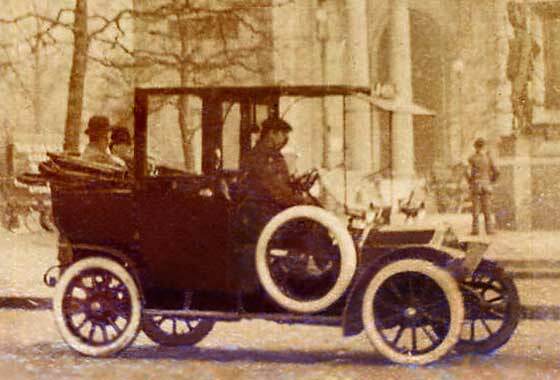 We can confirm that the car is indeed a cca 1913 Hupmobile Model 32 made by the Hupp Motor Company of Detroit, Michigan. Founded in 1908 by Robert Hupp, ex of Oldsmobile and Ford. A batch of photos received from Nigel Matthews (Canada) of a car that nobody seems to be able to identify. 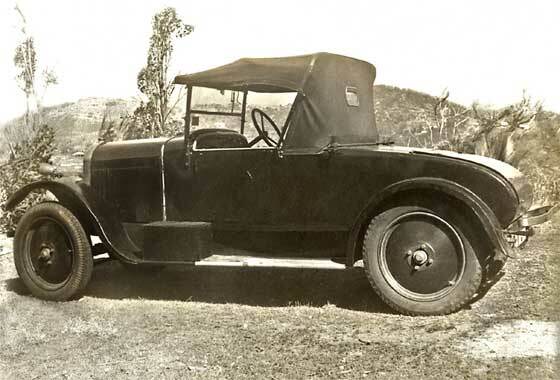 Car was owned by an Australian aviator Sidney Pickles who imported the car from England to Canada. Our Bryan Goodman says positively that it is a highly modified Model T Ford; rarely wrong. Others that it could be a four seat Eric Campbell, or an ABC (All British Ford). Other 'Rolls' radiators including Moon are out due shape of bonnet hinge and big stub axle protrusion on front wheel. Two lovely photos received from James Rankin, Randalstown, Co Antrim (N.Ireland) showing his grandfather who can be seen sitting on the bonnet of his car. It seems the car was also used as a taxi and for weddings etc. The registration number is IA-4515 was issued by the Antrim County Council. Unfortunately no records are available to assist in dating of the registration. The car is a cca 1924 Citroen B2. Being right hand drive, was probably assembled at Citroen factory in Slough. Photo received from Bruce Welch (Australia). His mother (born 1919) tells him it was a Singer. The photo was taken on Newport Plateau (near Sydney, Australia) in about 1939. The registration number was ME 261. Petrol was gravity feed and when almost empty the car would stall going up hills. During WWII when petrol was rationed, she had to drive backwards up the northern approach to the Sydney Harbour Bridge. Our Singer expert Simon Bishop advises that it is a cca 1926 Singer 10/26. A further lovely period photo received from Andrew Gordon (UK) who is writing a biography of a naval officer who owned the car in the item below. 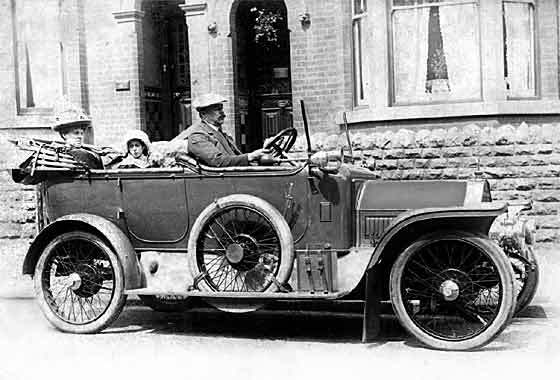 This photo shows him sitting in another car which looks inter-war, possibly late 1920s. Can we advise of the make. The car is cca 1925 AC 12HP Royal Four Seater. The AC Company (Auto Carrier) started in 1908 with a commercial three wheeler, then the AC Sociable, - but by 1926 they won the Monte Carlo Rally in a rapid sports car similar to this. Photo received from David Clifford (UK) showing his Grandmother next to a truck belonging to his Grandfather. 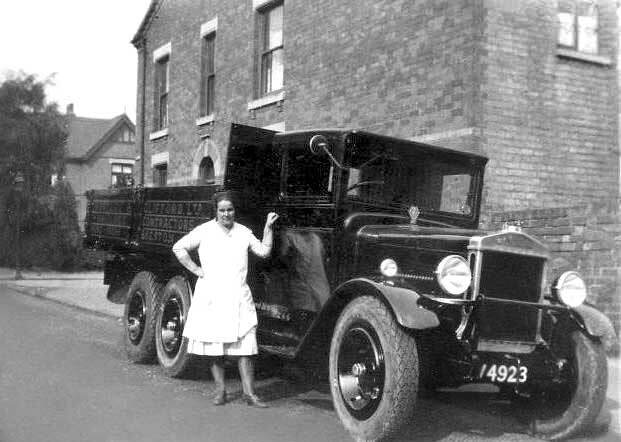 The truck appears new and the photo was probably taken in Beeston, Nottingham around 1927-8. We requested a better resolution photo but could not get one. Subsequently contacted by Michael Walters who has a site Walter's Vehicles where he has a section which deals with Willys Overland Crossley who made " Manchester " lorries in Heaton Chapel, Stockport. Photo received from Mike Cowell of Northill (UK) showing him aged about 3-4 (cca. 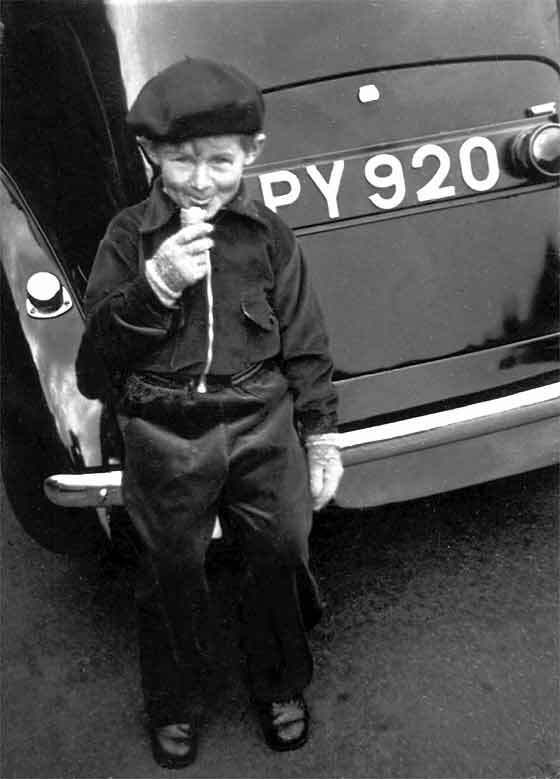 1950) sitting on the back of a car which he is not sure it it was his Uncle's or his Grandfather's. If the latter, it may have been a Riley. Therefore it is probably his Uncle's because the car is a cca 1938 Austin Big Seven. These were manufactured between 1937 and 1940. The registration PY is a North Riding of Yorkshire County Council issue. APY would have started October '37, BPY would have started July '39. Photo received from Charmian Griffin of TATE etc (UK). 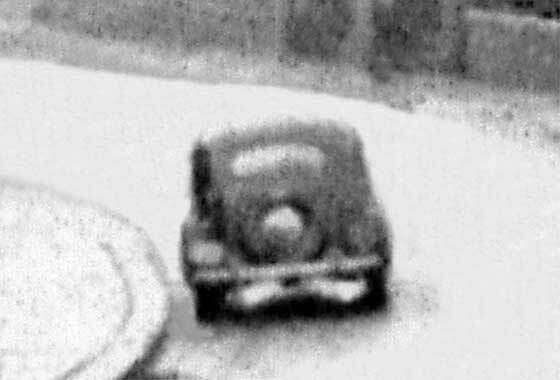 They are publishing a photograph by Oliver Sacks in Kilburn, London, in 1947, and would like to know make/model of the car featured. We think it is probably a cca 1940 Ford V8 Pilot. Pilots were manufactured in various forms from the late 30s to the late 40s. Seems the photo is either reversed or of a left-hand drive car. Numberplate appears to be on the left whereas it would normally be on the right. Difficult to be precise. Tiny photo received from Frances Miller (Ireland) and no responses to our requests for better scans. We need high resolution scans please especially if the photos are small. Our motorcycle expert Robin Vince has identified the motorcycle as a 1913/4 Douglas 350cc, 2.75hp horizontally opposed twin. He is sure on this because he has restored and rode one for several years. 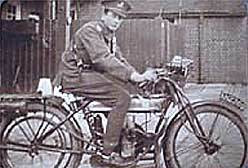 These machines were extensively used by British Army in France by First World War Despatch Riders (DRs). Photo received from Roy Spencer (Jersey C.I.) showing Charles Maurice Keyworth who flew Farman Shorthorn, Avro and Sopwith Pups with the RFC/RAF in the First War. Later a successful businessman in the fabric chemical trade, retired to Jersey. Subsequently his wife set up the Keyworth Institute. 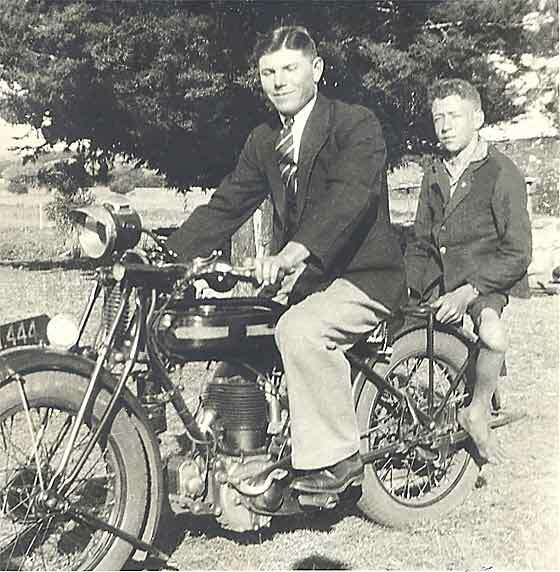 Our Robin Vince thinks the bike is a cca 1917 Sunbeam with a 770cc JAP V twin. Many were supplied to the forces in Italy and Russia, and the French. Registration is Glasgow cca1916/17. One of a number of photos received from Alan Mack (UK) showing a motorbike and a car. The car was an extremely rare Eric Campbell and the motorbike is no easier. Our motorbike experts agree that the engine is a Blackburne but think the bike was made by one of many small bike manufacturers in mid twenties. Not a Levis, not a Douglas, the frame like AJS but wrong fuel tank. 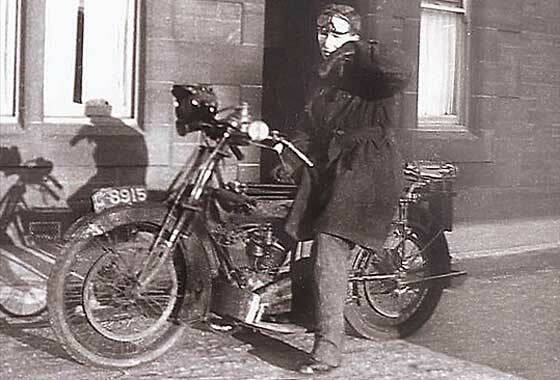 Could be a Chater Lea, a Cotton or an Excelsior, or AJS with a Blackburne engine. Reg is 1923 London. 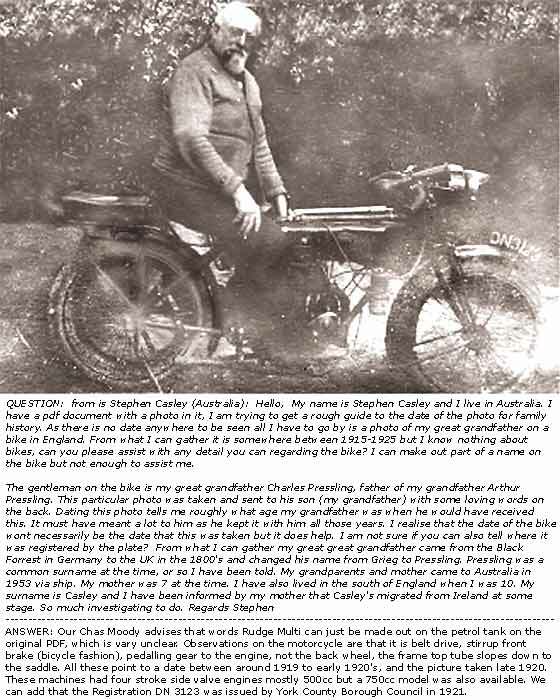 Photo received from Stephen Casley (Australia) of his great grandfather Charles Pressling. Photo was sent to son (grandfather Arthur Pressling) with some loving words. Our Chas Moody advises that 'Rudge Multi' can just be made out on the petrol tank. Belt drive, stirrup front brake, pedaling gear to the engine, and frame top tube slopeing down to the saddle, point to 1919 / early 1920's. Registration DN 3123 was issued by York CBC in 1921, so, it is a 1921 Rudge Multi 500 or 750. Photo received from Len Greyling (Australia). We know nothing about it, apart from that it was take in the mid 1930's, as no subsequent reply. Our Chas Moody advises that the name Triumph can just be made out on the engine. It is a 'flat tank' model, tank fits between the upper and lower frame tubes, which dates it as pre-1929. Front forks with the centre spring were typical of 1927 models. The engine is a four stroke side valve, probably 500cc, so, a cca 1927 Triumph 500. Photo is later.